As many of you know I’m a bit of a foodie. I like eating well but I also like eating nutritiously. I feel like many kids these days are not eating real food and are being fed a high carb high sugar low protein diets. I’ve worked really hard to feed my son well and in many ways it’s paid off. That being said, cheezits and cheesy goldfish not only exist in my house but he loves them. They are however, a treat not a staple. As Easter approached I found myself again struggling with nutrition issues and commercialism issues. As such I said, I’m buying one bag of jelly beans and I’m going to give my son pom poms and pom pom creatures that I made. 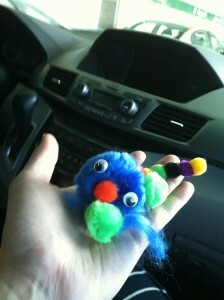 I went with the idea that if I added googly eyes to a pom pom it’d be cool. After this experience I stand by my assessment that googly eyes make it all better. All you need is a glue gun and a bag of pom poms and of course… googly eyes! my disclaimer.. I’m not endorsing these as safe or whatever. I thought they were fun for my kiddo, you make the choice for safety for yours. This is a little wee monster…. googly eyes and wee pom pom horns. 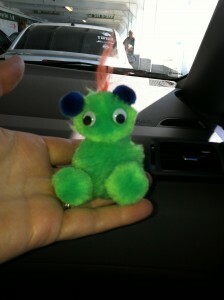 I found that the large pom poms sometimes have fuzzy extras and I used it to make hair for the wee green monster. He’s so cute and has received many kisses from my kiddo. 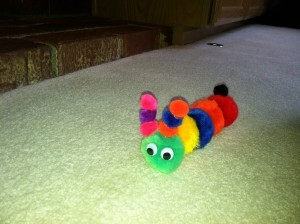 I’m also including my pom pom caterpillar. The green monster is pretty simple but would be better with a nose. To create noses cut a pom in half and then glue that puppy on. To make the caterpillar you have to move a little slower. To create the antenna you glue two tiny poms together and hold ’em till the glue cools. You can gradually add on a pom at a time but you should wait for the glue to cool/solidify before adding another pom. If you don’t you end up with a mess and a bunch of sticky fuzzy mess. The same goes for each portion of the caterpillars body.